The recent discovery of an article in the 30 January 1873 edition of the Los Angeles Weekly Express changes the story (see the recent post here) about when the covered bridge across the Los Angeles River from downtown to the east side over Old Aliso Road, now César Chavez Avenue, was built. It was erected by the Pacific Bridge Company, whose headquarters are in San Francisco and Oakland, and under the immediate supervision of Mr. C. H. Gerrill, the Secretary of the company. It is a very substantial and extensive structure, and will be one of the most useful and sightly public improvements in the county. The bridge proper has two spans of 150 feet each, roofed and inclosed [sic] the entire distance. The Pacific Bridge Company was started in Oakland by William Henry Gorrill, who learned bridge building in his native Ohio and settled in San Francisco in 1869. There was a boom in bridge-building and Gorrill and brothers, including the C.H. "Gerrill" in the above quote formed the firm and used an 1867 patented design by R. W. Smith for their projects. The process involved "bridge kits" with elements built at the company factory and then shipped to the site. After a description of the structural work, including how its chords and trusses were designed to distribute weight and strengthen the bridge, as well as noting the intricacy of the pine flooring, three piers of iron sunk 13 feet into the river bed, and the use of "the most approved concrete" to anchor the piers and absorb the weight of the structure, the article gave the dimensions as 24 feet wide by 475 feet in length and it was sure to note that there were 200 piles in the trestles. 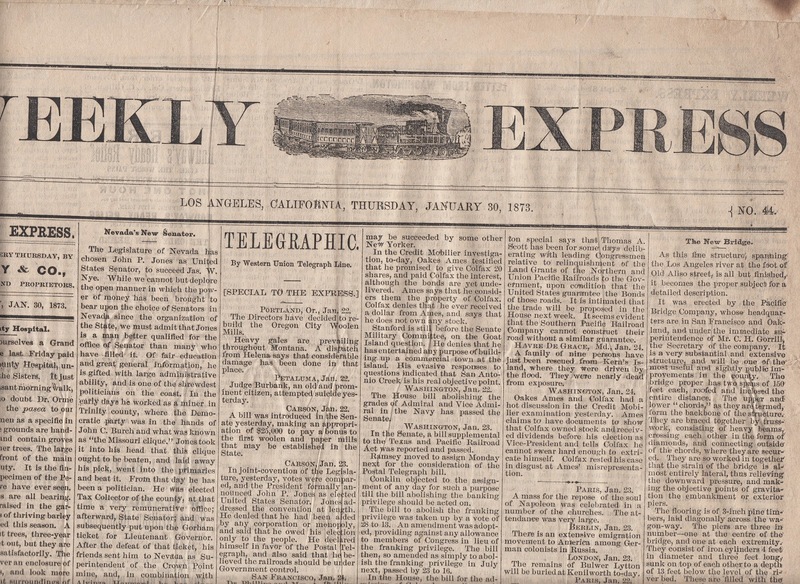 The front page of the 30 January 1873 edition of the Los Angeles Weekly Express with the far right column article being about the completion of the covered bridge that ran across Old Aliso Street, now César Chávez Avenue, and the Los Angeles River between downtown and the emerging east side. From an original in the Workman and Temple Family Homestead Museum Collection. Click on the image to see it enlarged in a new window. The paper also reported that the Pacific Bridge Company "is building two other bridges in this county—one across the old San Gabriel, at Foster's crossing [this would be in today's Bell Gardens at the Rio Hondo], and the other across the new San Gabriel, about one and a half miles beyond Gallatin [this being in present-day Downey]." The paper reported that the bridge near Gallatin was nearly completed, while the former was in the early stages with the piers in position. The work on the Aliso street bridge will be finished to-day, and it will be ready for use as soon as the city has made the grades required on each side of the river to run the approaches even with the bridge. The Weekly Express opined that "the Council [Los Angeles' Common Council, now the City Council] should pass an ordinance to regulate the uses of this bridge, and provide for lighting, for as it is closely roofed, it will be as dark as a railroad tunnel, at night . . ."
Finally, the article finished by stating that, "the entire cost of three bridges is $59,000, in seven per cent bonds of the county." So, the bridge was completed close to three years late than elsewhere stated and that Perry and Woodworth did not build the structure. It does make sense, moreover, that the early 1873 opening would have directly facilitated the development of Los Angeles' first subdivisions east of the river, first being East Los Angeles, now Lincoln Heights, in 1873 and then Boyle Heights two years later. More information on the construction of the covered bridge on Old Aliso Street (now César Chávez Avenue) was unearthed in an 8 January 1873 issue of the Los Angeles Evening Express. The article dealt with the three bridges built on the Los Angeles, old San Gabriel (Rio Hondo) and San Gabriel rivers. On the covered bridge, the article reported: "This bridge is to 575 feet long, composed of 175 feet of trustle work on the city side of teh river and two spans of 150 feet each. These spans rest on iron piers four feet in diameter, which are sunk in the river bed to solid bottom. They are capped with blocks of frear stone, weighing 1750 pounds each, which rest entirely on the concrete with which the iron columns are filled." The article went on to state that the first span was being raised and that the lower chords of 6 x 12 inch size and running 46 feet long were run and 24 foot posts were installed with the chord timbers bolted together. Then the upper chords were put on and bolted to the top of the posts. Braces equal in size to the posts were then installed for full support. The wood was pine from the Puget Sound region of what was then the Territory of Washington an the structure "is to be 18 feet high to the top of the top chord, and wide enough for loaded teams of all kinds to pass with ease." Finally, it was observed that, "the bridge is to be roofed with redwood shingles, sided up and painted." In a "General Remarks" section, the piece clarified the question of which firms were involved in the construction, noting that "these bridges are being built by the Pacific Bridge Co., of Oakland . . . [and] they are now employing a force of about 20 men, most of whom are mechanics, and will push the work to completion as rapidly as the weather will allow." However, the article also related that, "the timber for these bridges is being dressed at the mill of Messrs. Perry, Woodworth & Co., who got their planer bed extended to enable them to dress timber of this extreme length. Their work is spoken of very highly by the framers, who say it is equal to the best work of the kind done in San Francisco." The paper added that the framing was done behind the mill, where halves of the spans were joined and then carried to the river for raising."